we are ready to go, are you! ok, its a day (or two) late but late is better than never ;) after blogging every day for a year, it's hard to get back into the habit after a break away from it, it kinda goes lower down the priorities list ... i'll get there though because i love sharing! 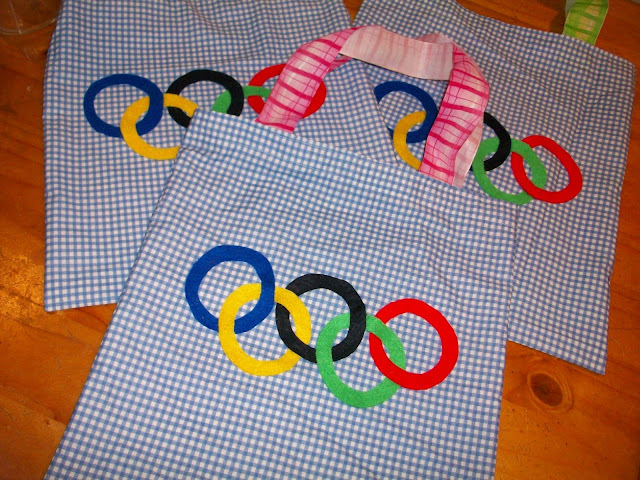 the olympic kits i have made for my family to get us involved with the games AND to make it an enjoyable learning experience for us. i home school ... so sure, learning is important to us but even if you don't home school, getting actively involved with all life has to offer must definitely be a top priority and that's why i find any excuse, occasion, celebration to get excited about and i MAKE my family join me and i encourage you to get on board too! you can make the celebration fit into your budget, i guarantee you will find things around the home that will work and if you have a computer and LOVE free printables as much as i do, you are home and hosed. if you are new here (welcome) i will catch you up with the idea behind our olympics celebration, home-style. each member of the family has been given a "second" country to support at the olympics. i make sure for every event i chose different countries so there is always a new culture to explore. 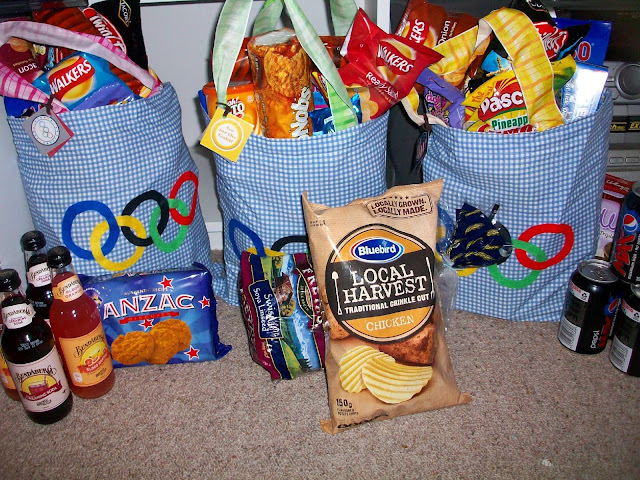 each person gets a goodies bag full of printables, recipes, foods, flag, books, craft ideas, information, and other bits and pieces from our country (new zealand), the host country (england, we've expanded this out to include the four british countries), and their "second" country. for this summer olympics we have usa (ben), australia (pollyanna), belgium (me), and switzerland (steve). 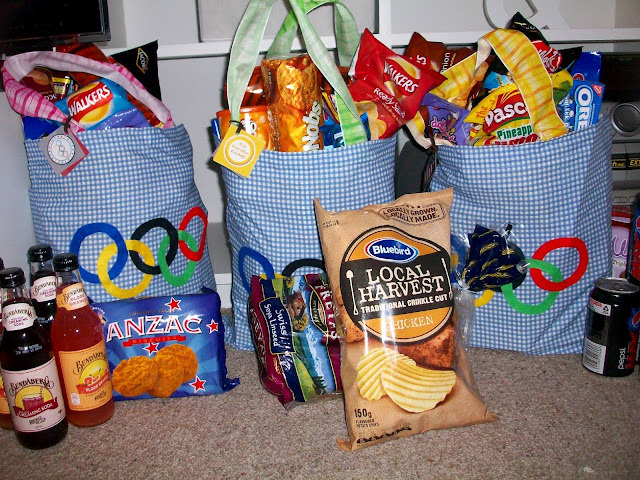 i made these bags, the same tutorial as i used here for the halloween goody bags ... just a bigger version of it! i went onto the book depository (they ship free worldwide, love that!) 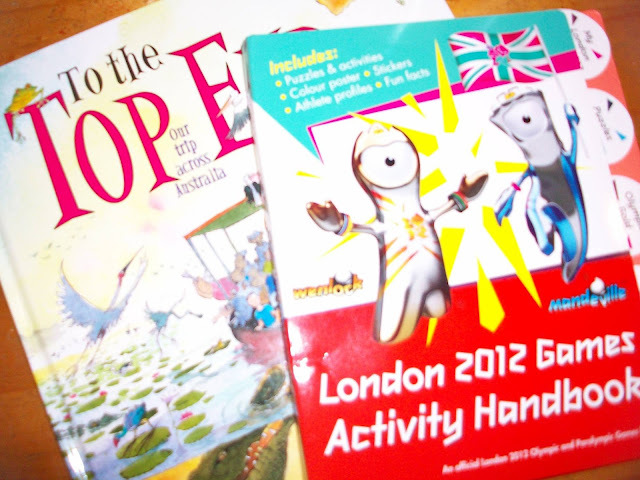 and chose an official olympics activity book for each of the peeps, plus a fiction book that takes place in their second country. i have provided each person with their team lists for each sport and also included the new zealand team. if you use the team lists from wikipedia you can download them as a pdf and print four pages to one. the wikipedia lists are fantastic and my favourites as they provide the draws and tables the peeps can use to fill in as they see the athletes competing. 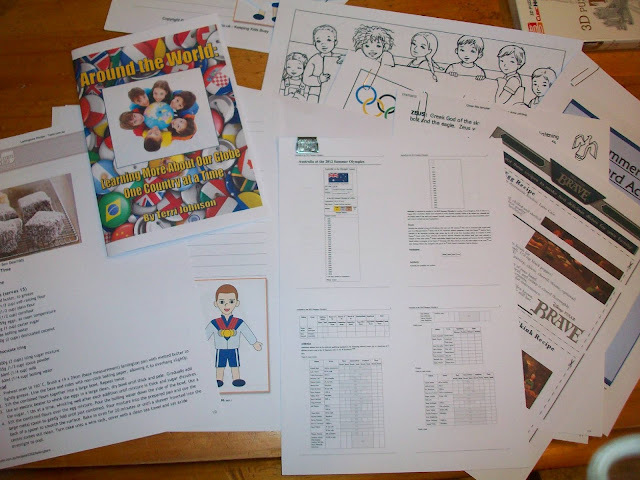 i then used a whole lot of free printables to put in each goody bag, every thing from opening ceremony bingo cards, word searches and crosswords, bookmarks to personalise, olympic writing paper as the peeps will have to write something everyday about what they are witnessing, colouring pages, and some fantastic free country units from currclick. the next step is to make full use of the international section of your local grocers/supermarket. 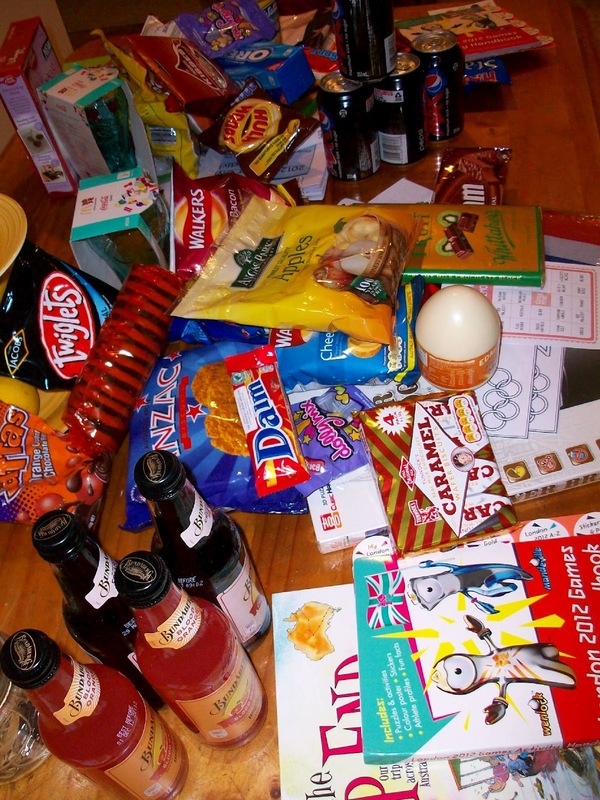 before i went i googled the favourite foods for each of the countries so i would have some idea of what i was looking for. for example, i had no idea (even though we are next door neighbours) that tim tams were an australian invention! the world is such a melting pot you will be amazed at how many things are in your local grocers that you use weekly that actually originate from somewhere very different :) if you want some good ole' new zealand products check the lamb in the butchery dept, the kiwifruit in the produce dept (if it's zespri, it's from nz) ... you get the picture! make it an adventure, i always learn SO MUCH putting these goody bags together for the family. a table full of goodies from usa, australia, swiss, belgium, english, and new zealand. i added a couple of other bits and pieces, this time we went with real flags rather than colouring some in. 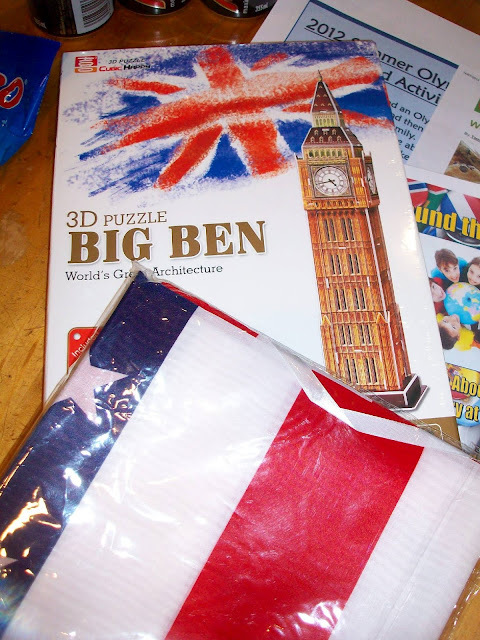 i found some truly british landmark puzzles, and a couple of other trinkets.